This article is about the species of fish. For other uses, see Bluefish (disambiguation). The bluefish (Pomatomus saltatrix) is the only extant species of the family Pomatomidae. It is a marine pelagic fish found around the world in temperate and subtropical waters, except for the northern Pacific Ocean. Bluefish are known as tailor in Australia, shad on the east coast of South Africa, and elf on the western North American coast. Other common names are blue, chopper, and anchoa. It is a popular gamefish. The bluefish is a moderately proportioned fish, with a broad, forked tail. The spiny first dorsal fin is normally folded back in a groove, as are its pectoral fins. Coloration is a grayish blue-green dorsally, fading to white on the lower sides and belly. Its single row of teeth in each jaw is uniform in size, knife-edged, and sharp. Bluefish commonly range in size from seven-inch (18-cm) "snappers" to much larger, sometimes weighing as much as 40 lb (18 kg), though fish heavier than 20 lb (9 kg) are exceptional. Bluefish are widely distributed around the world in tropical and subtropical waters. They are found in pelagic waters on much of the continental shelves along eastern America (though not between south Florida and northern South America), Africa, the Mediterranean and Black Seas (and during migration in between), Southeast Asia, and Australia. They are found in a variety of coastal habitats: above the continental shelf, in energetic waters near surf beaches, or by rock headlands. They also enter estuaries and inhabit brackish waters. Periodically, they leave the coasts and migrate in schools through open waters. Along the U.S. East Coast, bluefish are found off Florida in the winter. By April, they have disappeared, heading north. By June, they may be found off Massachusetts; in years of high abundance, stragglers may be found as far north as Nova Scotia. By October, they leave the waters north of New York City, heading south (whereas some bluefish, perhaps less migratory, are present in the Gulf of Mexico throughout the year). In a similar pattern overall, the economically significant population that spawns in Europe's Black Sea migrates south through Istanbul (Bosphorus, Sea of Marmara, Dardanelles, Aegean Sea) and on toward Turkey's Mediterranean coast in the autumn for the cold season. Along the South African coast and environs, movement patterns are roughly in parallel. 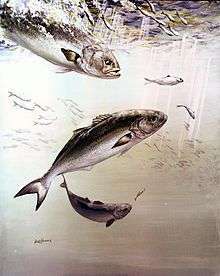 Adult bluefish are strong and aggressive, and live in loose groups. They are fast swimmers which prey on schools of forage fish, and continue attacking them in feeding frenzies even after they appear to have eaten their fill. Depending on area and season, they favor menhaden and other sardine-like fish (Clupeidae), jacks (Scombridae), weakfish (Sciaenidae), grunts (Haemulidae), striped anchovies (Engraulidae), shrimp, and squid. They are cannibalistic and can destroy their own young. Bluefish sometimes chase bait through the surf zone, attacking schools in very shallow water, churning the water like a washing machine. This behavior is sometimes referred to as a "bluefish blitz". Bluefish should be handled with caution due to their ability to snap at unwary hands. Fishermen have been severely bitten, and wearing gloves can help. Wading or swimming among feeding bluefish schools can be dangerous. In July 2006, a seven-year-old girl was attacked on a beach, near the Spanish town of Alicante, allegedly by a bluefish. In the U.S., bluefish are landed primarily in recreational fisheries, but important commercial fisheries also exist in temperate and subtropical waters. Bluefish population abundance is typically cyclical, with abundance varying widely over a span of 10 years or more. Bluefish are highly sought-after sportfish (and restaurant fish in some places) that had been widely overfished across the world's fisheries. Restrictions set forth by management organizations have somewhat helped the species' population stabilize. In the U.S., specifically along the seaboard of the middle Atlantic states, bluefish were at unhealthy levels in the late 1990s, but management resulted in this stocks being fully rebuilt by 2007. In other parts of the world, public awareness efforts, such as bluefish festivals, combined with catch limits, may be having positive effects in reducing the stress on the regional stocks. Some of these efforts are regionally controversial. Bluefish are often caught and used as live bait for tuna, shark, or billfish. The bluefish is the only extant species now included in the family Pomatomidae. At one time, gnomefishes were included, but these are now grouped in a separate family, Scombropidae. One extinct relative of the bluefish is Lophar miocaenius, from the Late Miocene of Southern California. ↑ NatureServe (2015). "Pomatomus saltatrix". IUCN Red List of Threatened Species. Version 4.1 (4.1). International Union for Conservation of Nature. Retrieved February 25, 2016. ↑ "Bluefish Identification". Retrieved 2009-02-17. 1 2 3 Froese, Rainer and Pauly, Daniel, eds. (2006). "Pomatomus saltatrix" in FishBase. March 2006 version. 1 2 3 Pomatomus saltatrix (Linnaeus, 1766) FAO, Species Fact Sheet. Retrieved October 2012. ↑ "Saving the Sultan of Fish". ↑ Norcross, J. J., Richardson, S. L., Massmann, W. H., Joseph, E. B. 1974. Development of young bluefish Pomatomus saltatrix and distribution of eggs and young in Virginian coastal waters. Trans. Am. Fish. Soc. 103:477-497. ↑ Schultz, Ken (2009) Ken Schultz's Essentials of Fishing John Wiley & Sons. ISBN 9780470444313. ↑ Lovko, Vincent J. (2008) Pathogenicity of the Purportedly Toxic Dinoflagellates Pfiesteria Piscicida and Pseudopfiesteria Shumwayae and Related Species ProQuest. ISBN 9780549882640. 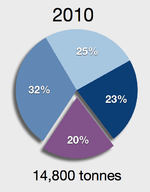 ↑ "Bluefish_ Status of Fishery Resources off the Northeastern US". ↑ Ulanski, Stan (2011) Fishing North Carolina's Outer Banks University of North Carolina Press. ISBN 9780807872079. ↑ Bluefish FishWatch, NOAA. Retrieved 5 October 2012. ↑ "Istanbul Celebrates New Hope for a Favorite Fish With First-Annual 'Lüfer Festival'". "Pomatomus saltatrix". Integrated Taxonomic Information System. Retrieved 30 January 2006. Bluefish NOAA FishWatch. Retrieved 4 November 2012.